Early detection is the critical point when it comes to the likelihood of survival, as nearly half of the heart attacks occur outside the hospital. A study done by the Center for Disease Control and Prevention has shown that 92 percent of the sufferers experienced chest discomfort as an early symptom of a heart attack. Only 27 percent of them knew that this symptom indicated a heart attack and knew that it was the time to call 9-1-1. The 6 symptoms below are the major early signs of heart attack. They could let you know that you are at risk of having a heart attack up to a month before it strikes. 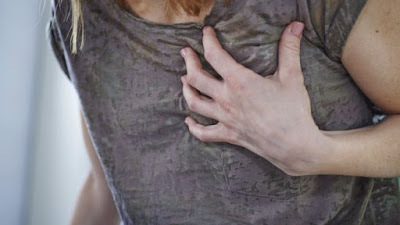 Chest discomfort comes in many different forms, such as burning sensation, pinching, or feeling pressure in the chest. These unpleasant symptoms may occur during physical activity or while you are at rest. In case you experience any unusual sensation in the chest, consult a doctor as soon as possible. Note: One can be having a heart attack without feeling discomfort in the chest, as it typically occurs in women. Unexplained fatigue may also indicate that a heart attack is on its way. As arteries begin to close up, the heart starts working much harder, and this in turn makes the performance of simple tasks much more exhausting. Consequently, this may lead to sleeping much longer or feeling the urge to take a few naps during the day. Persistent cough which doesn’t seem to subside after an extended period of time can be a sign of heart failure. This happens as result of the blood accumulated in the lungs, which is caused by the struggle of the heart to supply the body with sufficient amount of blood. White or pink mucus could be a product of blood leakage, so pay attention to this sign! In case of compromised heart function the blood circulation is restricted, causing lack of oxygen in the blood. This causes symptoms like dizziness and lightheadedness, which seek immediate medical attention. Shortness of breath is yet another common sign of an impending heart attack. The lungs and the heart wok in synergy, so as heart`s function deteriorates, the lungs fail to get sufficient amount of oxygen they need to function optimally. Hence, this leads to shortness of breath and difficulty breathing. Last but not least, heart`s struggle to pump blood may cause the blood to swell, resulting in a bloating-like effect. The legs, feet, and ankles are the major points of swelling as they are at the greatest distance from the heart. Peripheral cyanosis, a blue tinge in the extremities or on the lips, is also possible.